Over the summer and into the Autumn Term, Jubilee Hall Trust worked with Torriano and Argyle Primary Schools to get 350 children more active in Camden. We offered a free programme of activities over the summer holidays as well as after school sessions to provide opportunities for children to utilise the Camden Active Spaces playgrounds at times they would otherwise be closed. We had over 750 visits from children in the community, with participants from 25 local schools coming out to these free community sessions. The programmes were a huge hit with children and families alike. In addition to open play on the playground, we offered structured Energy Club games as well as taster sessions for parents and children to try out yoga, street dance, Capoeira, Zumba, and Latin dance. We saw the activity levels of participants increase drastically during this programme. At the end of the programme, average child activity increased from 12 hours per week to 30 hours per week – a 150% increase! And parents increased their average activity level from 6.8 hours per week to 12 hours per week – a 76% increase. The project also included staff training for 15 teaching assistants and school support staff at 5 schools. The training provided hands on skills and resources for getting children active in any space more regularly in a fun, inclusive, non-competitive way. 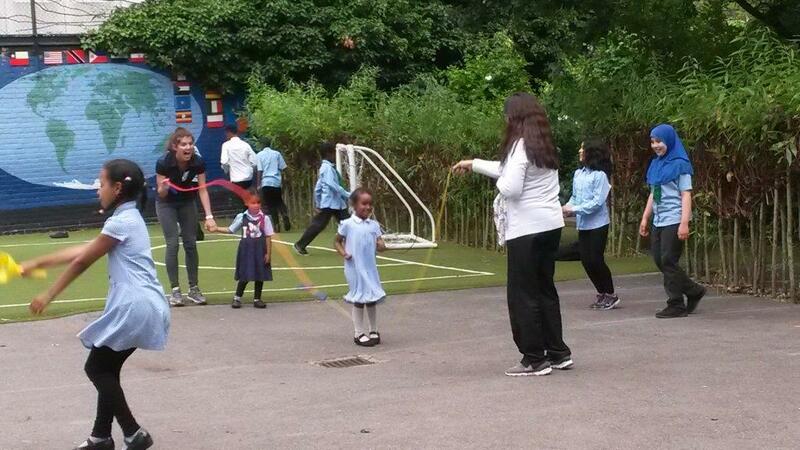 The Energy Club was largely supported by Camden Council and Proactive Camden. The additional projects and classes are funded directly by our charity. To support our work with these and other local schools, you can make a donation to our charity programmes.